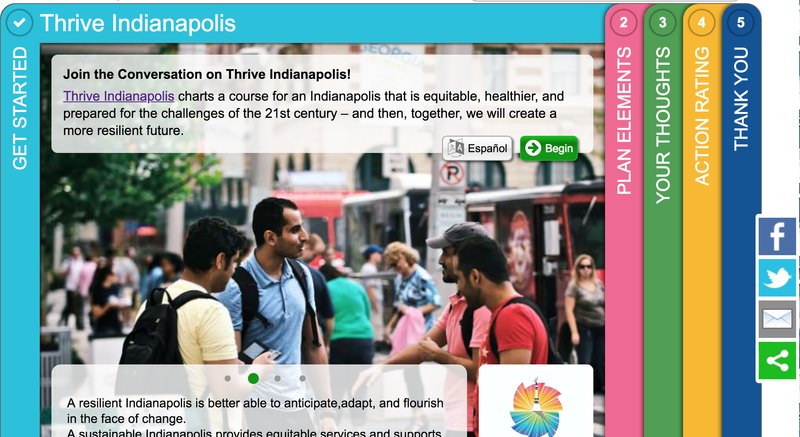 Read a quick update on Thrive Indianapolis, "How Indianapolis Used Animals, Bikes, Yoga, and a Passport to Engage Kids in Sustainability Planning." Many sustainability planning processes (and indeed planning processes in general) tout community engagement as the cornerstone of plan development. But we often see the same actors engaged time after time. These are often representatives and members of environmental nonprofits and super civic-minded citizens. While their opinions are important, ultimately the needs and perspectives of huge swaths of the community are not reflected in the final plans because they weren’t given the right opportunity to voice them. 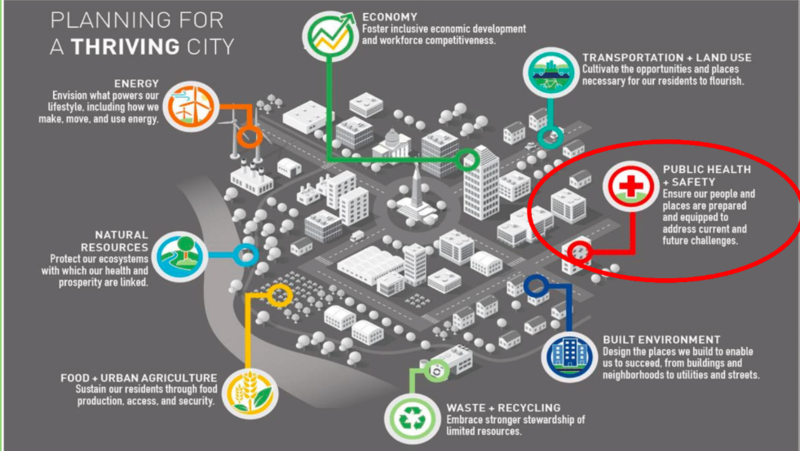 So it touches on everything -- and everyone -- from infrastructure to parks to jobs to food access to transportation options to safe streets to air and water quality. We’re still only halfway through the process, but so far the approach we’ve taken with the City and our partners to really shake up the standard community engagement game is showing results. Know who you need to reach. Indianapolis identified the most disenfranchised populations at the start and set aggressive engagement goals related to these populations. This includes: low-income, those experiencing homelessness, re-entry (those reentering society after incarceration), youth, seniors, Hispanics, African Americans, Burmese refugees, renters, and veterans. These are members of the community who -- as refugees or veterans, for example -- will have distinct experiences that impact resilience planning; who -- as homeless or low-income residents -- will be (and may already have been) on the front lines of any climate change impacts (i.e. flood, heatwaves) and economic stressors; who -- as the youngest among us -- will live with the results of today’s decisions for decades to come. Get an update on the youth outreach here. 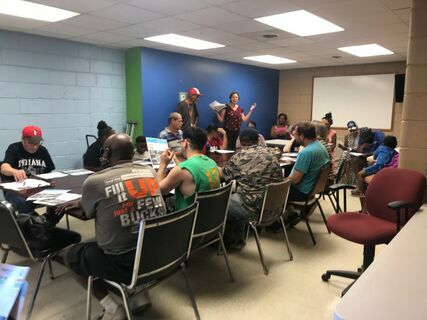 From the start we engaged partner organizations on the ground that serve these populations -- like Partners in Housing, Indy Hub, and Falam Christian Church and various veterans groups. 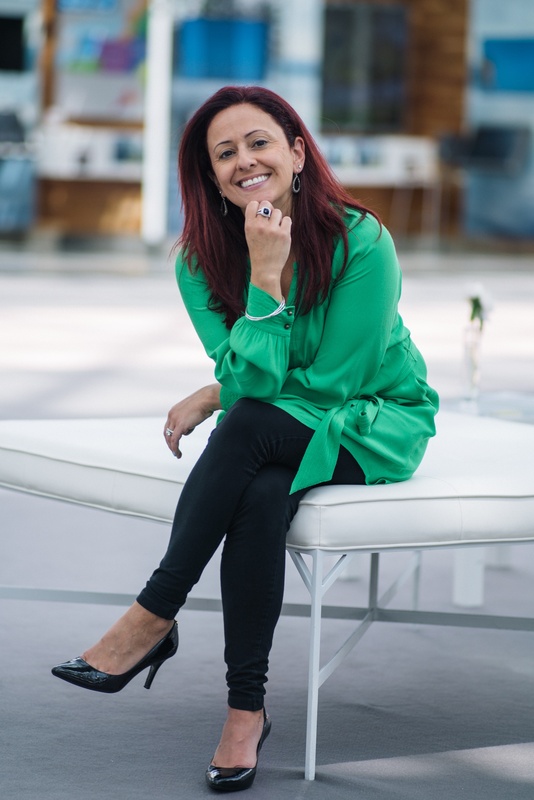 More on that below, but we sought advice from the partners up front on how and where to engage the targeted groups with a specific focus on the issues and messages that will resonate the most with each. Halfway through the process we are on track to reach our targets. For example, to date almost 35% of people engaged are African American (goal: 30%) and over 16% are seniors (goal: 10%). 2. Go to them, don’t make them come to you. Our Thrive team is meeting people where they are, not focusing on getting them to come to a community meeting (which can often be at inconvenient times or locations or make people feel out of their comfort zones). We’ve attended over 60 events -- many specifically organized by and with our partners -- and have regular pop-ups at everyday favorites like the library and farmers markets. At these events, the Thrive “Street Team” passes out hard copy surveys; while online surveys may make our lives easier on the compilation/analysis end, we have found that response rates are higher for paper forms and also more accessible to those who don’t have internet access. Created and implemented a preparedness training for an organization that provides life skills workshops to low-income residents. That included a workbook with discussion questions where we talked about Thrive, the challenges we face (including chronic stressors and shocks and a section on the projected impacts from climate change in Indy), and actions individuals can take to feel more prepared (emergency plan, emergency kit, etc). Held focus groups for veterans to better understand how their unique experiences shape their understanding of what it means to be "resilient." 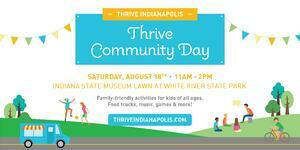 Planned a Community Day festival focused on kids and families for August 18. Get a post-event update -- including resources like the kids passport we designed -- here. And when we do host the more conventional community-wide meetings, we try to take an innovative approach like an interactive “speed planning” workshop where participants “date” the plan elements, moving from table to table and suggesting actions the community can take in each area. 3. Make it easy to give feedback. What about all the people who we won’t meet at an event? Or who will be too busy at those events to fill out a survey or given thoughtful feedback? We have rolled out a more interactive engagement platform through a partnership with MetroQuest to pull in new respondents. While our first few surveys gathered a good baseline of information about hazard perception, goals for Thrive and general understanding of sustainability and resilience, we are now releasing a new survey every week focusing one-at-a-time on the eight plan elements. That way people can focus on each particular topic without feeling overwhelmed. -- Communications packages for Thrive overall and each plan element, with facts sheets (snapshot of the Food and Urban Agriculture fact sheet at left; you can see all of the fact sheets here), surveys, graphics, social media posts, and a new video (click here or below to watch it). 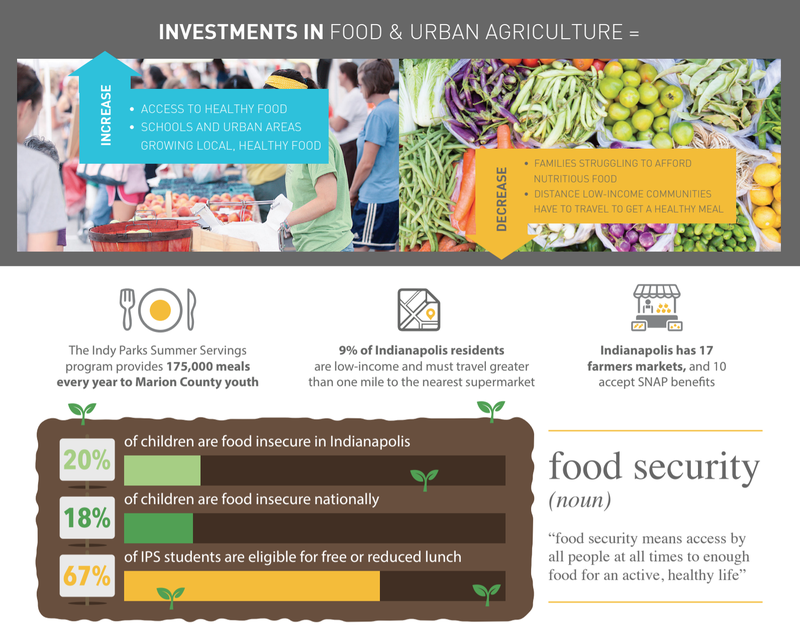 Thrive Indianapolis strives to ensure that the City is equitable, healthier, and prepared for the challenges of the 21st century. The ultimate goal is to create a stronger, more resilient future for everyone -- regardless of income, race, where you live in the city, your job, how you get to your job, and so on. 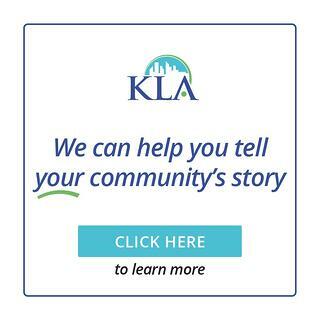 It is with that in mind that the City of Indianapolis and KLA are taking these steps to cast a wide net for community feedback on this sustainability and resilience plan. Stay tuned for more details and results from Thrive! If you feel like your public engagement strategies are stuck in a rut or could use a fresh approach, give us a call to chat about the opportunities.